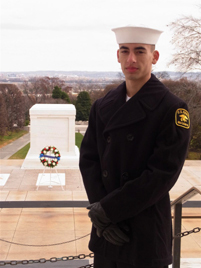 The Naval Order of the United States sponsored a wreath to be placed at the Tomb of the Unknown Soldier this past Saturday - the 72nd anniversary of the attack on Pearl Harbor. They asked that the Sea Cadets in the region perform the ceremony. Nicholas, as Cadet of the Year for his unit, had the privilege, along with the youngest in his unit, to participate. An incredible honor that we are all very proud to have been a part.